Shunyi is a great place to live, learn, and play. In the fall of 2015 Yvonne, a Shunyi mother, started Beijingles. Her daughter was not in preschool yet and she wanted something to do as there were no playgroups in the area. Yvonne wanted to encourage musical interaction between parents and kids; nothing too formal, just fun and inexpensive. Beijingles has been going strong for almost two years, twice a week at the Riviera Clubhouse. Most kids who attend are under five but older kids are welcome. 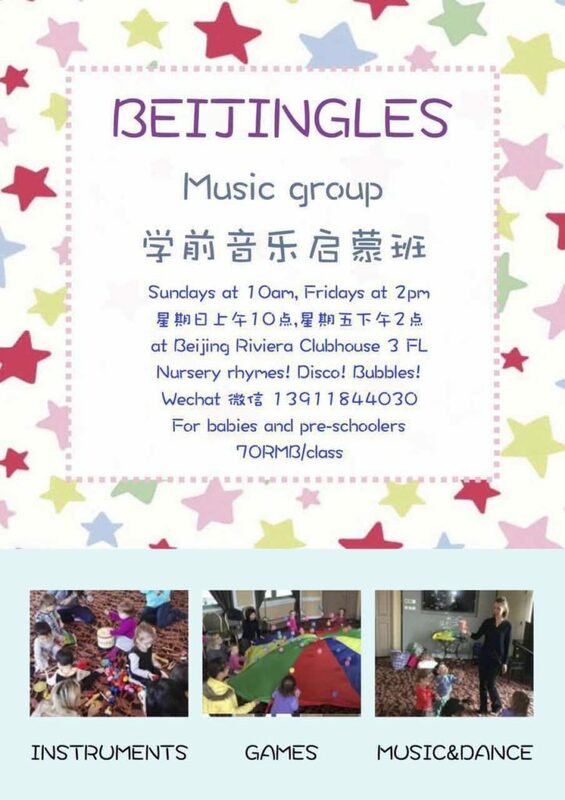 The price per class is RMB 70 and second child is half price; siblings under 8 months join for free. Yvonne hits the ball right on the head, as entertainment for kids in Beijing can be pricey; and it was this which made her determined to keep Beijingles affordable. I miss the free music classes and library sessions which we had in the UK. I attended a children’s centre in London from when my daughter was 6 weeks old. Granted, those early singing and dancing classes were more for the mothers than for the babies, but these support networks make all the difference in a parent’s life. Mothers like Yvonne who take time out of their busy lives in Beijing to set up and run playgroups are invaluable for community spirit amongst international families. “I find it very satisfying to see the little ones getting to know the songs, and anticipating the actions,” explained Yvonne, and she is quite right; nothing is more satisfying than seeing kids singing and dancing together.